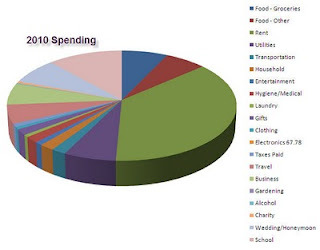 Here is my 2010 snapshot -- this recap treats Peanut's and my finances as joint for the entire year, even though we did not fully merge finances until after we married in September. I did this because we have the data, I just had to do some finessing to get it all into one document. From now on, I can always look back at this as the first full year of data for our joint net worth. As you can see, I came out in the hole for both of my side hustles. This was not by design but I have to say I'm kind of relieved. I think this is my last year doing these gigs, which will make my taxes easier. They're just not worth it anymore. Re: food -- YAAAAAAY! Despite brunching weekly for half the year, we spent more on groceries than we did eating out. Re: rent -- despite the high cost of living in New York City, Peanut and I are within the "safe" range of less than 30% of take-home pay for housing advised by experts. Re: Roth IRA contributions -- Peanut and I each maxed out a Roth IRA for 2010. However, we also topped off our contributions for 2009 before the April deadline, which is why this is higher than the per person per year limit of $5,000. Peanut and I live well within our means. We are currently focused on student loan repayment, retirement savings, and emergency fund growth. You guys are doing so well. Congrats on another great year. Thanks for the note about the Roth IRA. Before I read it I was trying to figure out if there's a provision that lets people contribute more than $5K a year (because I'd want to take advantage of it. LOL).